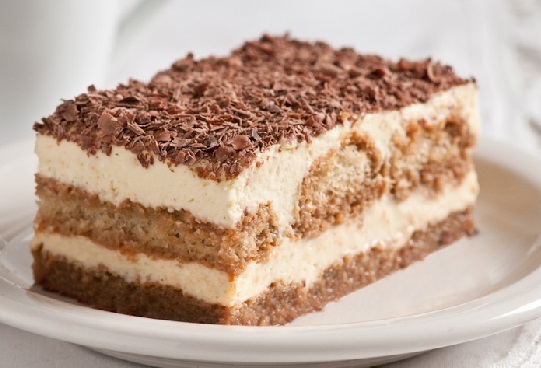 Tiramisu: Tiramisu is a popular coffee-flavored Italian dessert. It is made of ladyfingers (Savoiardi) dipped in coffee, layered with a whipped mixture of eggs, sugar, and mascarpone cheese and flavored with cocoa. Countless variations of Tiramisu exist, but we will using the modern version with Bailey’s Irish Cream and egg whites. Mix the coffee with 175ml of the Bailey’s Irish cream in a shallow bowl. Dip the savoiardi biscuits into this liquid; let them soak on each side enough to become damp but not soggy. Line the bottom of 8 1/2 inch square glass dish with a layer of soaked biscuits. Separate the eggs into yolks and egg-whites. Whisk the two yolks and 1 egg-white with sugar, until thick and a paler yellow. Fold in the remaining 75 of Bailey’s Irish cream, and the mascarpone cheese to make a moussy mixture. Whisk the single egg white until thick and frothy. Fold the egg white into the mascarpone moussy mixture. Spread half of this mixture on top of the layer of soaked biscuits, in the glass tray. Repeat with another layer of soaked savoiardi, and then top with the remaining mascarpone mixture. Cover the dish with cling film, and leave in the fridge for 2 hours or overnight. Tiramisu is ready to be served. If you have any queries regarding the Tiramisu recipe, please leave a comment.